Burlington, VT (March 28, 2019) – Social Sentinel today introduced the education industry’s most comprehensive, proactive approach to keeping students safe and preventing school violence. Social Sentinel, which pioneered the technology that scans public social media posts for signals of harm, has expanded to include email scanning for Gmail, image recognition and processing, and an anonymous sharing platform to voice concerns. The company’s solutions are designed to help school administrators pay attention to the myriad of important safety-related conversations happening online in their community, without straining staffing and budget resources, and to help them use these insights to promote overall social-emotional wellness and security. Social Sentinel’s social media scanning software sifts through upwards of one billion data points daily for threats of harm across multiple, complex platforms. When there is a match between a publicly accessible post containing language of harm and a client, Social Sentinel delivers an alert in real time, affording schools the opportunity to intervene and avert a problem. Social Sentinel’s platform of products are powered by AI and operate safely with respect to privacy. They are backed by subject matter experts in linguistics, data science, engineering, public safety and academia. Image recognition and processing – a picture can say a thousand words, and if it’s saying there’s a potential for harm or violence, Social Sentinel can help detect it. New technology allows publicly posted images and videos to be scanned for potential threats to safety. Integration with Gmail – With 68% of K-12 schools in North America using G Suite for Education, (Education Week Research Center, 2017), Gmail is a critical part of communication for students and can be a channel for conversations around bullying, harm, and violence. Social Sentinel now provides email scanning for Gmail, giving schools expanded awareness of safety-related conversations and insights happening on their system. shareit – school communities now have a tool to easily, safely and anonymously share their thoughts - both the positive and the negative. By capturing these range of sentiments, educators can better understand and manage the social and emotional climate of their school. One view to all relevant insights – access to clients’ subscription-based Social Sentinel products are centralized and neatly displayed through a single login. 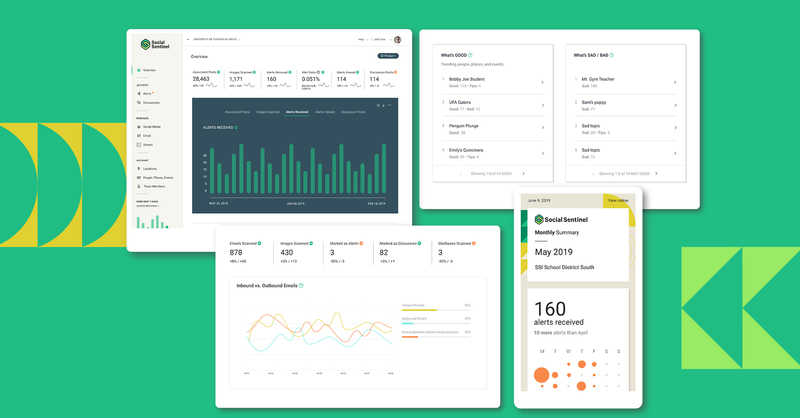 Data from each subscribed product such as alerts, insights, discussions, trending topics or sentiments displays through a single view, providing a simple, intelligent evaluation of concerns, threats, discussions, and analytics relevant to each client’s school safety. The holistic as well as detailed view gives school administrators a breakthrough look at overall social-emotional wellness, helping to guide safety programs, community discussions, and more. More information on Social Sentinel’s newly enriched platform of products can be found here.